Dangerous levels of radiation have leaked into the atmosphere after a third reactor exploded. Channel 4 News speaks to the man in charge of nuclear regulation during the Three Mile Island disaster. Victor Gilinsky, who was the senior commissioner on duty at the US Nuclear Regulatory Commission during the Three Mile Island disaster, told Channel 4 News the situation in each unit at Fukushima is more serious than the whole of the Three Mile Island incident. He said: “At Three Mile Island, there wasn’t any loss of power and the equipment functioned. The mistake was that people turned off the emergency cooling, thinking that that was the right thing to do, and fortunately two hours later there was a change in shift and and the operators turned the cooling back on. And that pretty much ended the accident. … As it is, in the first two hours, half the fuel melted. “If it (Fukushima) does get worse, you can have all the fuel melting. I expect a substantial fraction of the fuel melted in each of these reactors and slumped down. “As far as they know, the water level is about halfway up. If it gets worse than that and they lose all the water, then the melted fuel – and there are tens of tons, nearly a hundred tons of fuel in a large reactor – that could melt right through the bottom of the pressure vessel. Radiation levels just south of the Dai-ichi nuclear plant in Fukushima state were reported over 100 times the normal levels on Tuesday morning. In Maebashi – 60 miles north of the capital – radiation levels were up to 10 times the normal level. Fifty workers tried to cool and stabilize three reactors at the power plant when a fourth reactor caught fire. The fire was put out and was believed to be the source of the elevated level of radiation. In a nationally televised statement, Prime Minister Naoto Kan confirmed radiation has spread from four damaged reactors at the plant to a level dangerous to human health in the area around the plant. 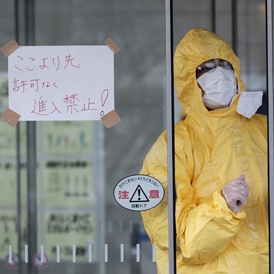 Kan and other officials warned there is danger of more leaks and told people living within 19 miles (30 kilometres) of the Dai-ichi complex to stay indoors to avoid exposure that could make people sick. “Please do not go outside. Please stay indoors. Please close windows and make your homes airtight,” Chief Cabinet Secretary Yukio Edano told residents in the danger zone. These are figures that potentially affect health. There is no mistake about that,” he said. He added that the last remaining people within a 20km (12 mile) exclusion zone around the plant had to leave immediately. Some 70,000 people had already been evacuated from a 12-mile (20-kilometer) radius from the Dai-ichi complex and about 140,000 remain in the zone for which the new warning was issued. The International Atomic Energy Agency, who was called in to advise the Japanese government, said it had been informed “that the spent fuel storage pond at the Unit 4 reactor of the Fukushima Daiichi nuclear power plant is on fire and radioactivity is being released directly into the atmosphere”. Tokyo Electric Power Company, the owners of the plant, admitted for the first time that there was a possibility of partial meltdown, the Kyodo news agency reported. Officials have already gauged that as a “high possibility”. Tokyo reported slightly elevated radiation levels, but officials said the increase was too small to threaten the 39 million people in and around the capital, about 170 miles (270 kilometres) away. “The amount is extremely small, and it does not raise health concerns. It will not affect us,” Takayuki Fujiki, a Tokyo government official said. Winds over the nuclear facility at Fukushima were blowing slowly in a south-westerly direction that includes Tokyo but will shift westerly out to sea later on Tuesday, a Japanese weather official said. But the French embassy said low-level radioactive wind from the nuclear reactor could reach Tokyo by evening. China’s nuclear safety agency said on Tuesday it was “closely monitoring” developments in Japan and strengthening checks on radiation levels in China, though no increase had been detected so far in China. Over 750 workers at the plant have been evacuated but around 70 technicians have stayed to stabilize the reactors even though radiation levels have become too high to conduct normal work. Workers cannot stay long and are going in and out of the control room, as well as monitoring from a different location. Japan’s nuclear safety agency says there are two holes in the outer walls of reactor 4 where the fire happened, but it’s not known if the inner containment system has been breached, which would expose the spent nuclear fuel to the outside air and cause a more serious leak of radiation. But the International Atomic Energy Agency say there may be a possible crack in the suppression chamber of reactor 2. That would allow steam, containing radioactive substances, to escape continuously. They say units 1 and 3 appear in tact despite explosions there. There are now plans to pour water into the holes of unit 4 in the coming days to prevent the fuel from melting after continued problems with the plant’s cooling systems. In a nationally televised statement, Prime Minister Naoto Kan said radiation had spread from four damaged reactors at the plant to a level dangerous to human health in Fukushima. He said he’d personally handle the crisis at a new response headquarters. One of the world’s leading nuclear experts Walt Patterson – a fellow at Chatham House – told Channel 4 News that the situation could potentially deteriorate further. “What is happening at the reactor site now is probably pretty serious panic as the circumstances in which they are trying to control these reactors gets more and more difficult,” he said. “Also whether they have reliable information from the control room and their dials and gauges – I’m beginning to guess they probably don’t – means they may have no idea what the condition of the reactor is,” he added. The 1979 accident at Three Mile Island in Pennsylvania, rated five on an international scale of zero to seven, was a partial reactor meltdown that caused no casualties. Chernobyl – the world’s worst nuclear disaster, rated at seven- killed well over 4000 people. Japan’s nuclear safety agency rated the accident at Fukushima at level four on Saturday. But France’s ASN nuclear safety authority said the incident should now be upgraded. ASN President Andre-Claude Lacoste said “We are now in a situation that is different from yesterday’s. It is very clear that we are at a level six, which is an intermediate level between what happened at Three Mile Island and Chernobyl. The International Atomic Energy Agency (IAEA), who was called in to advise the Japanese Government and monitor the situation, said the level of radiation has rapidly fallen from 400 millisieverts per hour at the height of the crisis to 0.6 millisieverts per hour late in the day. They indicated the spike in radiation levels was probably caused by the fire in reactor 4. Exposure to over 100 millisieverts a year is a level that can be fatal leading to cancer and cognitive degeneration, the World Nuclear Association said. The IAEA said about 150 people had received monitoring for radiation levels and that measures to “decontaminate” 23 of them had been taken. The Prime Minister and other officials warned there is a danger of more leaks and told people living within 19 miles (30 kilometres) of the Daiichi complex to stay indoors to avoid exposure that could make people sick. “Don’t turn on ventilators. Please hang your laundry indoors. These are figures that potentially affect health. There is no mistake about that,” he said. Japan’s Chief Cabinet Secretary Yukio Edano urged people across the country to remain calm. Tokyo reported slightly elevated radiation levels, but officials said the increase was too small to threaten the 39 million people in and around the capital, about 170 miles (270 kilometres) away fro the Daiichi plant. “So what it means is that depending on the concentration of the particles and depending on which level of the atmosphere they are issued, they could be taking a very different trajectory,” she added.